Amazon Music (previously known as the Amazon MP3 Store) offers free software for downloading music purchases to your computer. After you purchase music or if you're a member of Amazon Prime Music, you'll enjoy that music in several different ways, including downloading it with a mobile or desktop app. However, while it's true that Amazon's MP3 downloading tool might seem like the easiest way to download music to your computer, there is always the option of saving the songs through your browser, eliminating the need to download any software. Sign in to your Amazon Music by entering your regular Amazon email or phone number, and your password. On the left side of the Amazon Music page, under the My Music section, find the content you intend to download. Place a check mark next to one or more songs that you want to download through your browser and then click the Download button. To select everything on the page, use the topmost check mark to capture all of it. If you're downloading music from the Purchased section, you'll see a simple list of all the songs you've bought on Amazon. If you're looking at an album of songs, and you want to download the entire album as a ZIP file, the download button is hidden away in a small button with three vertical dots. To select a specific song to download out of the album, you can hover your mouse over the song to see a different three-dot button that lets you download just that one song. A message displays that asks if you want to use the Amazon Music app to download the music. To save the Amazon music without using the app, click the link called No thanks. You may see a message that says that you need to authorize the device before you can download music. You can authorize several devices with your account, so click Authorize device to give your computer the authority to download music out of your account. 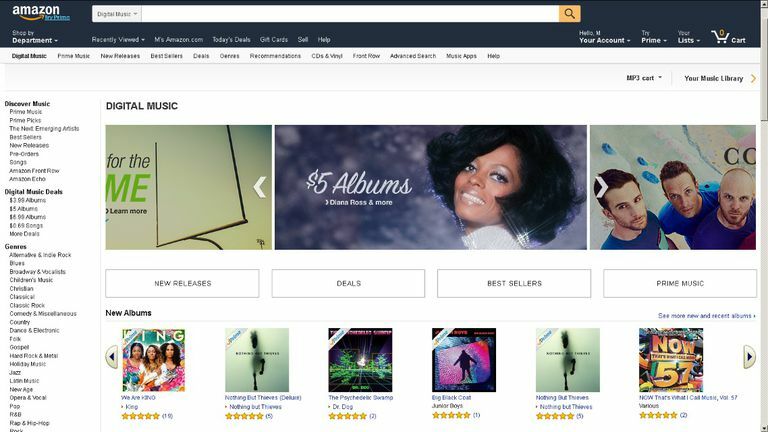 Go to Amazon's Digital Music section to look for music you can buy. Use the menu on the left to browse for songs. You can also use the search bar to quickly find something specific. When you find a song you want to buy, use either the buy button (the one that has the price written on it) to reach the last step of the process to buy the song or use the cart button to add it to your MP3 cart so you can keep shopping before making the purchase. When you buy a song on Amazon, you'll get a message showing that the order is complete. On that final screen you'll see a Play Now button to listen to the song in your browser, as well as a Download Purchases button to save the MP3 right away.